Some products are better for certain uses than others. A piece of brass will be beautiful indoors on a jewelry chest but if put outside on a door frame without first being coated (we recommend boat varnish), it will quickly become an embarrassment. This is why you should let us know where you intend to use the item(s) when you order. That way, if there's a problem with the particular material for the intended use, we can alert you. Plastic is a perfect example! The plastic we use for engraving is probably the world's best: Rowmark™. However, some colors have a different fabrication than others and as a result, some are more suitable for outside usage. Conversely, here's a plastic sign that a customer used outside without having mentioned to us its intended purpose. It's still plastic but the particular finish of the plastic was totally unsuitable for the use he had. If we'd only known he was going to mount this to an OUTSIDE trophy, we could have suggested something that would have functioned FAR better. If you come to visit us, you'll see that we have pieces of various materials inside, outside, and just about everywhere so we can put what we sell to actual, real-life tests. 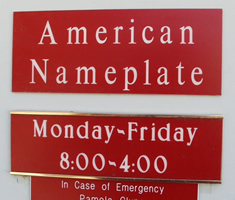 That concern for YOUR product is just one of the things we hope you'll like about doing business with American Nameplate! You don't need to be familiar with lamicoid process, phenolic plastic, or any of the terms that are used in the engraving/sign industry. What you want to know is: will it work for what I want? Here at American Nameplate, we're used to dealing with these questions and can help you make the RIGHT decision, first time! Call on us for your engraving and signage needs.